After fertilisation, the zygote divides several times to form an embryo within the ovule. 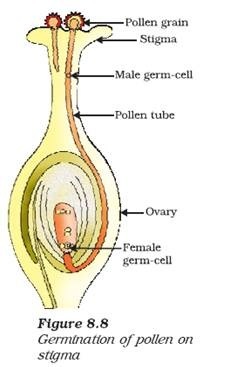 The ovule develops a tough coat and is gradually converted into a seed. The ovary grows rapidly and ripens to form a fruit. Meanwhile, the petals, sepals, stamens, style and stigma may shrivel and fall off. Have you ever observed any flower part still persisting in the fruit? Try and work out the advantages of seed-formation for the plant. 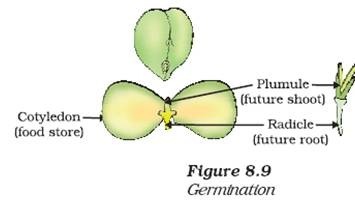 The seed contains the future plant or embryo which develops into a seedling under appropriate conditions. This process is known as germination. Soak a few seeds of Bengal gram (chana) and keep them overnight. Drain the excess water and cover the seeds with a wet cloth and leave them for a day. Make sure that the seeds do not become dry. Cut open the seeds carefully and observe the different parts. Compare your observations with the Fig. 8.9 and see if you can identify all the parts. Hi ya admin, I am interested in this also. (Please take a look at my latest article for more info.) Your post makes for very interesting reading, you have definitely provided me with some food for thought.